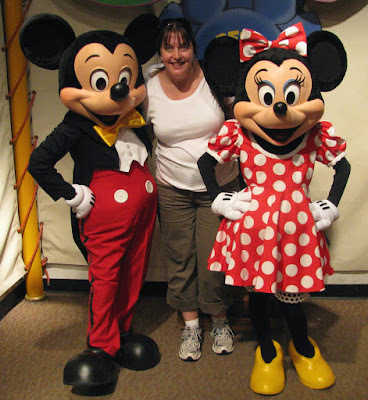 I have to admit, it was pretty exciting meeting the mouse himself, Mickey Mouse, Minnie being there was a bonus. When I was a kid, Sunday nights at 6PM was my favorite time of the week. That was when "The Wonderful World of Disney" tv show came on. I remember seeing THAT castle and Tinker Bell flying in to wave her magic wand to make that nights show begin. I have so many favorites that I remember; The Apple Dumpling Gang, Herbie and the Love Bug, and Witch Mountain, to name a few. And of course all the lovable cartoon characters; Donald Duck, Goofy, and of course the mouse himself, Mickey Mouse, though, Winne and his friends have always been my favorite. I always dreamed of one day going there, and this year that dream came true. A year long planned trip with my brother and his family to Disney World in Orlando, Florida was everything I could of hoped for and more. 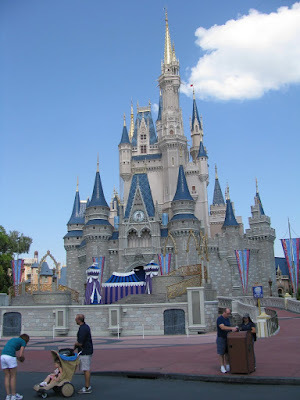 It really is a magical place, and it's not just for kids, it's for children and adults who have maintained that youthful spirit, I had a blast. Cinderella's Castle took my breath away, it didn't even look real. The first thing I noticed on that first visit to "Magic Kingdom" was how very organized it all is, starting in the parking lot. It is a well run machine, designed to make your trip as enjoyable and stress free as possible. You can't help but notice how clean the parks are and they really are a place for celebrating life, it's hard not to get caught up in it. My first character "meet and greet" at Disney World, Pluto! 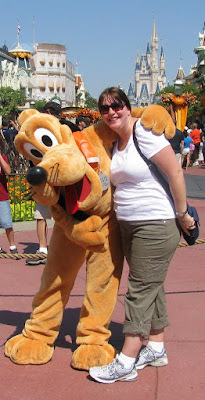 We visited all four parks while there; The Magic Kingdom, Animal Kingdom, Disney Hollywood Studios and Epcot. I enjoyed all the parks, but I think the Magic Kingdom was my favorite, as that's where Cinderella's castle is and also where I met my favorite Disney character, Winnie the Pooh. Me and my favorite bear, Winnie the Pooh! It was worth the 41 year wait to meet him. All the parks put on special shows through out the day; short plays, musicals, parades and fireworks at night. There is so much going on, and to see and do. You most certainly can't do it all in a day. Goofy waves at the crowds during a parade at Animal Kingdom, as he passed us he shouted, "we sure are having a wing ding of a time!" I now know why they call this "the most magical place on earth", and I look forward to a return visit in the future. I've never been ... looks like a fun place! I LOVED watching "The Wonderful World of Disney" every week. It was the only night of the week that we were allowed to eat in from of the TV at our house.